This story was written for WRAL TechWire Innovator partner Gig East. These aren’t just the lyrics to a popular Beatles song, they’re also words that Wilson lives by when it comes to exploring innovative options and opportunities for its business and entrepreneurial community. Catchy alliteration aside, the phrase evokes a mental image of a place that is ebbing and flowing with ideas, research, experimentation and the root of all exploration — possibility. Wilson hasn’t shied away from looping in others to advance the realization of its vision. Its network is a game changer, yes, but networking itself is also at play. “The City of Wilson is really cool in that it’s a completely fiber city,” said Dan Moore, one of the co-founders of Wisp City, a Raleigh-based startup focused on enabling connectivity for the Internet of Things. IoT is a network of physical devices equipped with technology that facilitates connectivity and the exchange of data. Wisp City is working on deploying new networks for sensor devices at the municipal level. Wilson is one of the cities that the company has partnered with to pilot its devices. Essentially, in analogical terms, Wilson’s Greenlight is the power and Wisp City provides network devices that leverage that power. Wisp City has plans to leverage Greenlight with a network that allows one access point for things like smart parking meters that would cover 10,000 parking spaces, rather than running a cable for each one individually. Moore said cities like Cary are already employing smart city technologies like smart water meters on residential housing. Similarly, Wilson is looking into flood-sensing devices, provided by Virginia-based company Green Stream Technologies Inc.
Lindquist said they hope to reduce property loss and help with people’s safety in flood-prone areas. 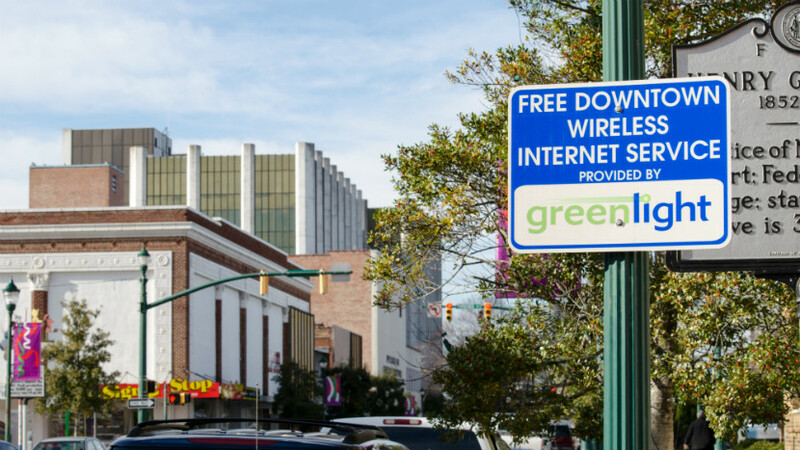 Though Green Stream and Wilson are currently in the “courting” phase, Lindquist said that they plan to incorporate the data from the sensor devices into Wilson’s Greenlight gigabit fiber-optic network so that neighborhoods can get relevant information in real time. NC RIoT, a 501(c)(3) non-profit focused on economic development across the state, facilitated the Wilson/Green Stream connection. RIoT spends a lot of its time “convening” people and resources and has been working with the City of Wilson for the past year. Snyder described RIoT as “connective tissue” that finds opportunities to bring technology into civic applications that can benefit citizens, particularly in smart cities or those trying to become “smarter” like Wilson. RIoT also runs RIoT Labs, a start-up accelerator and incubator space for early-stage IoT companies. Some of these partners include IBM, Lenovo, SAS, Verizon, Microsoft, Cisco, Citrix, and other big name and local companies alike. Snyder said Wilson is doing innovative things, particularly with Greenlight, that make it a forward-thinking, citizen-serving city. He made clear that RIoT helps with team building and ideation, but once they “get people together to have that conversation,” RIoT gets out of the way. Wilson’s partnership with US Ignite is another example of a municipality and an outside resource coming together. US Ignite is a national nonprofit that advances smart city technologies and options. It provides technical assistance for next-generation communities and helps them seek industry partnerships. Wilson is part of US Ignite’s Smart Gigabit Communities Program, a cohort of 25 cities dedicated to building up advanced technology investments. US Ignite secured a $10,000 grant to help Wilson purchase a specialized drone prototype. The drone camera has the ability to be integrated with city services. Wilson’s partnerships are exhibitory of the city’s endeavor to become a “living, learning lab” and a reminder that you can do more than get by, you can excel with a little help from your friends.